The FM486 is a high performance PMC-X/XMC module dedicated to data acquisition, processing and communication applications with complex requirements. 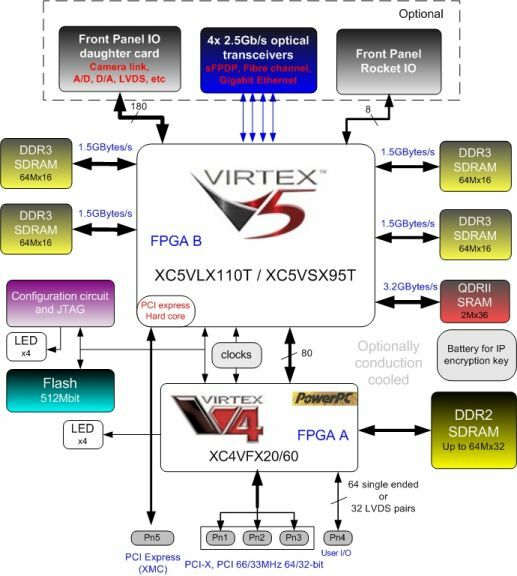 The FM486 offers fast on-board memory resources and two FPGAs (Virtex-4 and Virtex-5). High bandwidth communication throughput is easily achieved via optical transceivers for applications where data acquisition, processing and real time recording cannot suffer the bandwidth throttle associated with conventional processors.